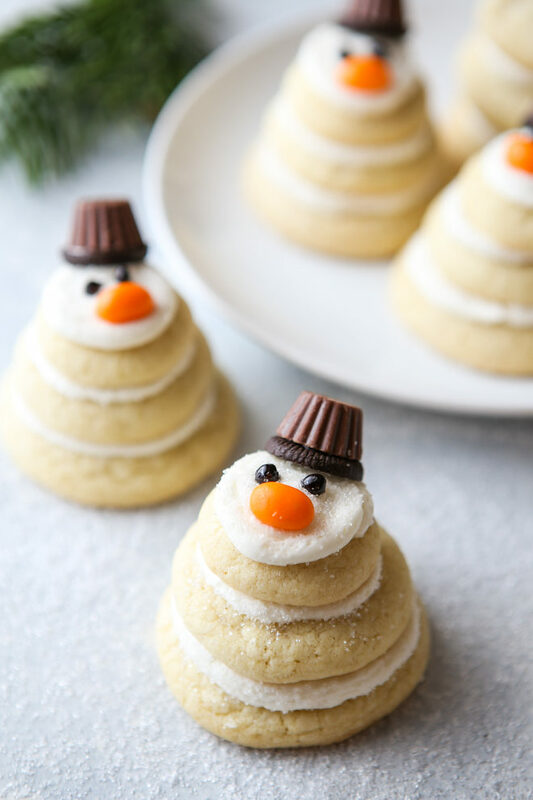 Snowman sugar cookies are adorable and fun to make! 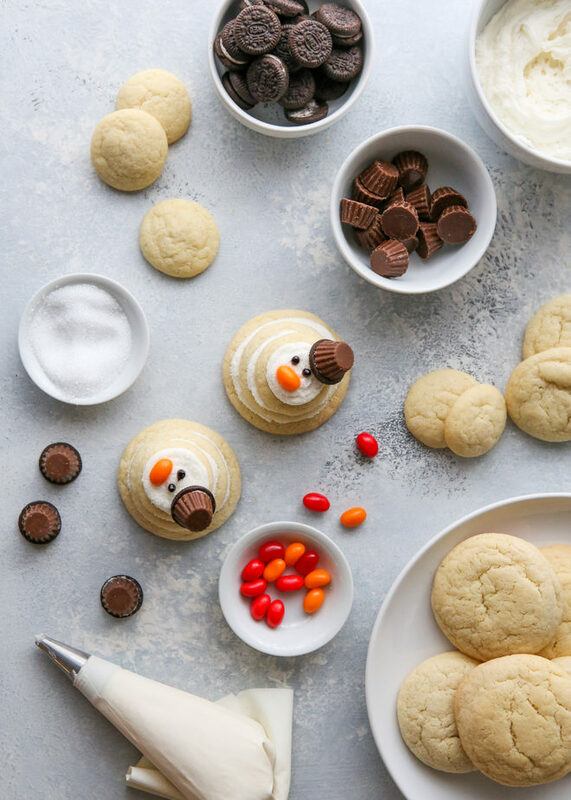 These little snowman sugar cookies may just be the cutest things I’ve ever baked. I mean, just look at those little faces! And lucky for all of us, they are surprisingly easy to make. 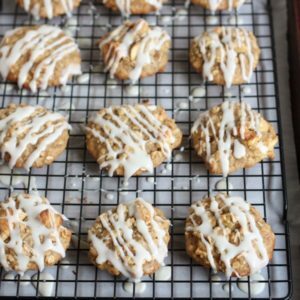 The sugar cookies are a quick no-chill, no-roll recipe and assembly is simple enough that the whole family can join in on the fun. How awesome would these be as edible gifts for friends, teachers, and family? 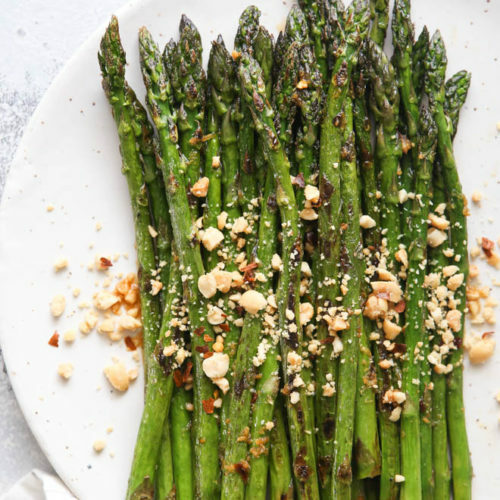 And just imagine how popular you’d be if you brought a plate to your next holiday party! Use 3 sizes of scoops to portion out cookie dough for each layer of the snowman— I used a medium cookie scoop (#40, 1 1/2 tablespoons) for the bottom, a tablespoon for the middle, and a teaspoon for the head. 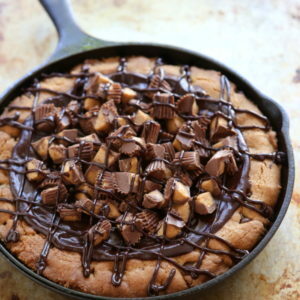 Bake each size together so the cookies bake evenly. The frosting is my favorite whipped vanilla buttercream. Sprinkle white sanding sugar over the frosting for a snow-like effect. For the noses I used orange jelly beans. To make the eyes, gently pipe store-bought black gel decorating icing. To make the top hats, separate mini Oreos. Use a dot of frosting to attach mini Reese’s to 1 Oreo half and place on top of the snowman. 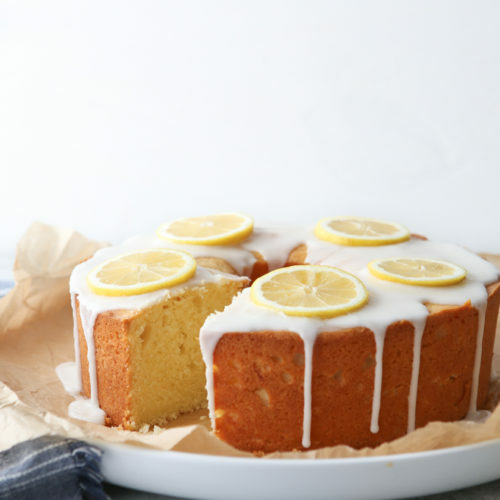 This recipe was originally published on the Go Bold With Butter website. Preheat oven to 350 degrees F. Line 3 sheet pans with parchment paper. In large bowl, beat butter and sugars using electric mixer until light and creamy, about 3 minutes. Add egg and vanilla; mix until combined. Add flour, baking soda, salt and cream of tartar; mix on low until incorporated. Use a medium cookie scoop (#40, 1 1/2 tablespoons) to portion dough into 8 rounds for the bottom of the snowmen. 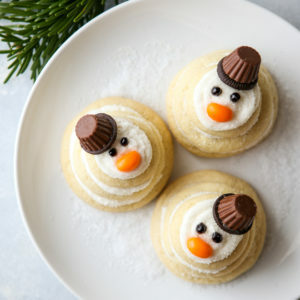 Use a tablespoon to portion dough into 8 rounds for the middle of the snowmen. Use a teaspoon, portion dough into rounds for the heads of the snowmen. 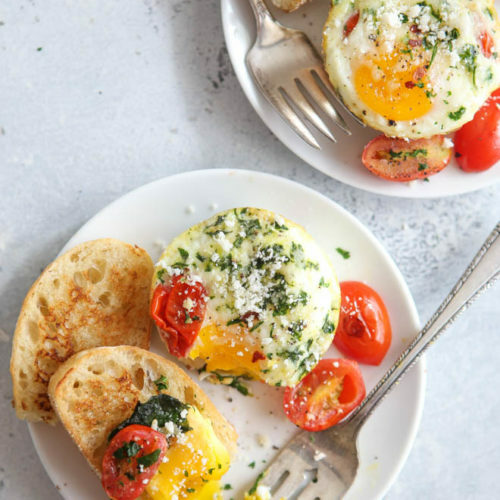 Place each size of rounds on a separate prepared sheet pan. Bake cookies just until edges begin to turn golden brown, 11-13 minutes for large cookies, 7-8 minutes for medium cookies, and 5-7 minutes for small cookies. 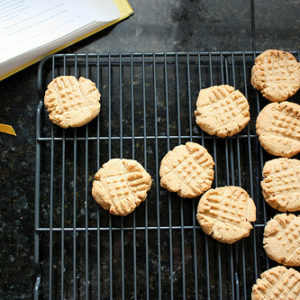 Let cookies cool on the sheet pan about 5 minutes, then transfer to a wire rack to cool completely. Beat butter, powdered sugar, vanilla and 2 tablespoons milk on high speed until smooth and creamy. Add more milk if needed to get a spreadable consistency. Spoon frosting into a piping bag fitted with a medium plain round tip. Pipe frosting on top of large cookie, sprinkle with sanding sugar and place medium cookie on top. Pipe more frosting and sprinkle with sanding sugar, and place small cookie on top. Pipe top with frosting and sprinkle with sanding sugar. Use the black gel decorating frosting to make the eyes and place a jelly bean for the nose. 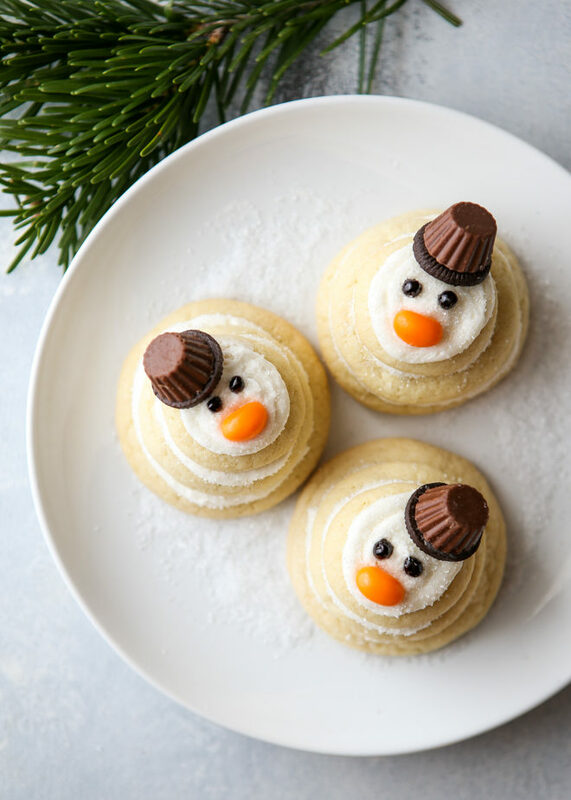 Use a bit of frosting to sandwich a mini chocolate cookie and peanut butter cup together to make a hat and place on top of the sugar cookie snowman. Repeat to assemble remaining snowmen. For best results, serve the day they are assembled, but they can be stored in an airtight container at room temperature for several days.